The conference will take place at the "Realfagbygget" AUDITORIUM R2 at the Gløshaugen campus at the Norwegian University of Science and Technology (NTNU), Trondheim, Norway. 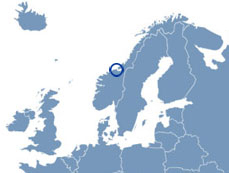 Trondheim is served by rail, bus, boat and air from major cities in Norway and in Europe. The city of Trondheim maintains a comprehensive description of how to get to Trondheim. From Trondheim Airport Værnes, in addition to taxi (Norgestaxi or TrønderTaxi), there are two shuttle bus lines to city: Flybussen and Værnes Ekspressen. Flybussen operates slightly more frequently (every 10 minutes). The driving time between the airport and the city is about 40 minutes. The shuttle busses are lined up in the street just outside the arrival terminal. Tickets can be purchased on the bus (most credit cards are accepted). The shuttle busses pass by most major hotels in the city. Ask the driver for guidance when you purchase your ticket. All hotels in the city center are within walking distance to the Gløshaugen campus. From downtown, the main bus is otherwise AtB bus 5 (direction Lohove, bus stop: Gløshaugen Nord). When you are at the NTNU campus, we recommended you use MazeMap to find your way. NTNU - the Norwegian University of Science and Technology - is Norway's primary institution for educating the nation's future engineers and scientists. The university also has strong programmes in the social sciences, teacher education, the arts and humanities, medicine, architecture and fine art. 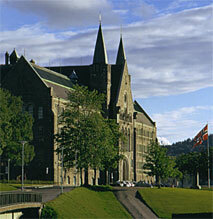 With a population of about 165,000, Trondheim is Norway's third largest city. Think of it as an ancient city with a modern soul. Trondheim was Norway's first capital city, founded more than 1,000 years ago, in 997, but now instead of Viking raiders and Hanseatic traders, you will find jazz musicians and an international student body savouring Trondheim city life. The city's cafes spill out onto cobblestone streets lined with colourful wooden buildings, while the twin towers and copper-clad spire of Europe's northernmost gothic cathedral frame the southern skyline. With its snow-capped mountains, deep green valleys and sapphire blue fjords, Norway is recognized the world over for its scenic beauty. Combine that with Norway's cultural heritage – whether it's the Urnes Stave Church, a thousand-year-old wooden structure that's on the UNESCO World Heritage list, or the more contemporary charms of Oslo's Vigeland Park or the music of Edvard Grieg, and you will find that Norway has something to offer everyone. While Norway lies at the very top of Europe – and in fact includes the island archipelago of Svalbard, home to the most northerly communities on the planet – the country's climate is moderated by the Gulf Stream, and features four distinct seasons. Far more unusual than the country's climate is the way that the light changes with the seasons, with the midnight sun in summer and the long twilights and northern lights of wintertime. Trondheim Hostel "Vandrerhjem" A low-priced alternative situated around 25 minutes walk to Gløshaugen Campus. Single room is around NOK 450. A bed in 4-persons room NOK 315. Bedclothes: NOK 60. Breakfast 50 NOK. There is a small kitchen in the single rooms. For the following three hotels you can refer to the "University" UHA agreement and that you will attend a conference at NTNU, or you may want to check whether you can find a lower price than indicated below. A more comprehensive list of hotels in Trondheim is available via the the official Trondheim web site.